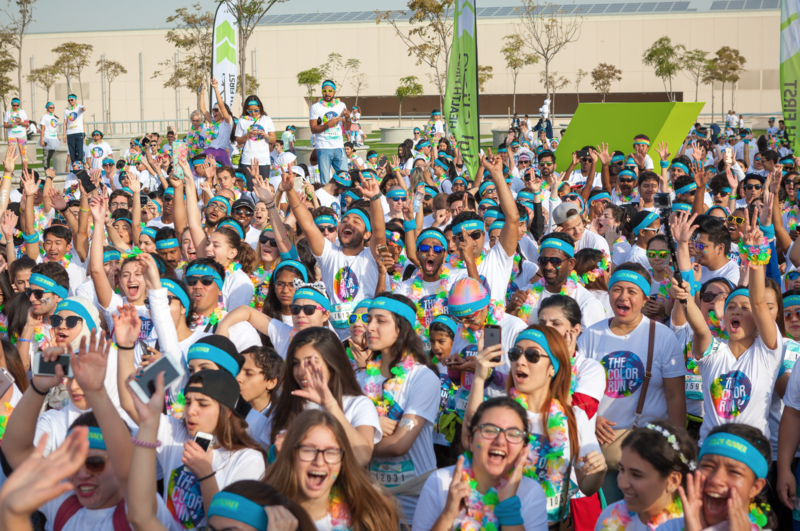 The Color Run presented by Sahtak Awalan: Your Health First, has concluded its third staging in Doha at Qatar National Convention Centre (QNCC). In total, 7,200 Color Runners completed the ‘Happiest 5K on the planet’ and got coated from head-to-toe in a tropical array of colors each kilometer of the course until the finish line. One of the biggest and most colorful events that Doha has ever seen, this edition of The Color Run presented by Sahtak Awalan: Your Health First brought a new theme to Doha through its Tropicolor World Tour. Thousands of participants, young and old, veterans and first-time Color Runners walked, jogged and skipped their way through the five-kilometer course as they got bathed in Tropicolor powder at each of the five Color Zones. The new theme; the Tropicolor World Tour, included an explosive Tropicolor Zone, palm trees, bright colors, and island-style music. Also featured were Rainbow Beach and the Finish Festival, a larger-than-life celebration at the interactive island, featuring, music, unique photo opportunities and massive color throws. With 7,200 Color Runners, Doha has once again demonstrated Qatar’s vision to encourage residents to lead healthier and happier lives. Events such as The Color Run celebrate health, happiness and individuality and encourage participants of all ages and abilities to focus on their lifestyle and well-being. “We would like to thank everyone for joining us today, and for their enthusiasm, great spirit and most importantly their commitment to maintaining a healthy and active lifestyle. We would also like to thank our partners, Weill Cornell Medicine – Qatar with this third edition of The Color Run presented by Sahtak Awalan: Your Health First, and their ongoing support and commitment to encouraging residents of Qatar to continue to lead a happy and healthy lifestyle”. A portion of the proceeds are being donated to Educate a Child by The Color Run with 1$ of every entry donated to the charity.